Need a new trivet hotpad? Well grab that old t-shirt and start cutting. 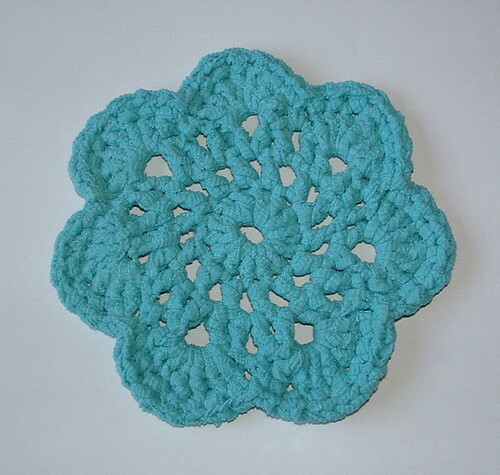 This cute flower hotpad was crocheted from the front piece of an old cotton tank top of mine. This particular tank top had side seams so I cut it across from side to side so I could stretch it to created what I call curled t-yarn. Here is my picture tutorial on how to make curled t-yarn. The nice thing about these trivets is that they are a quick project and only require about 40 yards of t-yarn. Because this was a shirt with side seams, when I reached the side, I just cut at a diagonal to turn so I could work across the front again. Little “tags” are created when you make the turns but can be trimmed once you curl the t-yarn and can be easily hidden within your stitches or at the back of your work. As you can see, all my little tags don’t show. Anyway enjoy this recycled t-shirt project and happy green crafting to all!